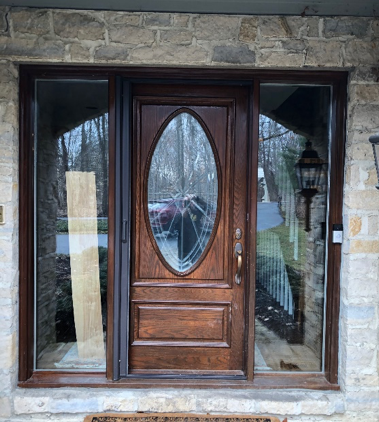 This customer in Columbus, Ohio recently darkened the exterior of their house to a modern deep brown color. The front stained door was too dark and got lost under the porch amongst the new darker colors. 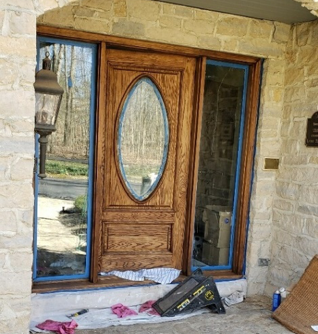 The customer wanted a more modern front door with a lighter, distressed wood look. So, we got to work for them! We taped and tarped around the area to protect the stone and glass. Then removed the door hardware and screen. 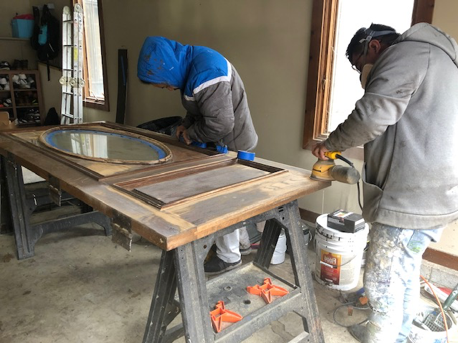 We stripped and sanded the door for days to get down to the natural oak and remove all the clear coat and old stain. The bare wood was heavily yellowed from age and years of dark stain penetrating the fibers. We spent a couple days bleaching the wood with a two-part hydroxide mix to remove the yellow and bleach out the wood. The customer tried a few different color stains on test pieces of wood. They selected a popular lighter shade from Minwax called Provincial. 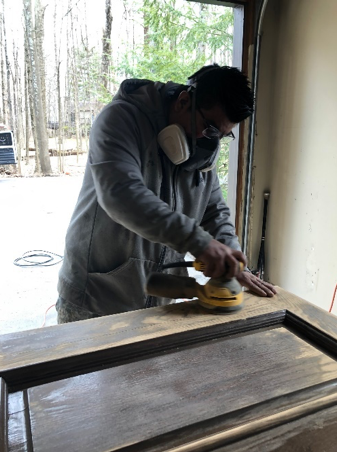 After that stain dried, we applied a special Marine Varnish Poly Urethane clear coat and the wood and stain came alive! 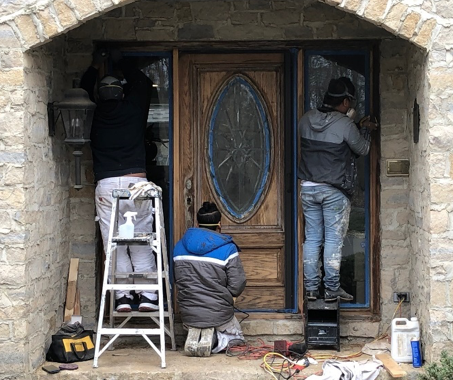 The customer was very happy with her newly transformed front door that lightened the entryway and gave it a more welcoming and contemporary feel. 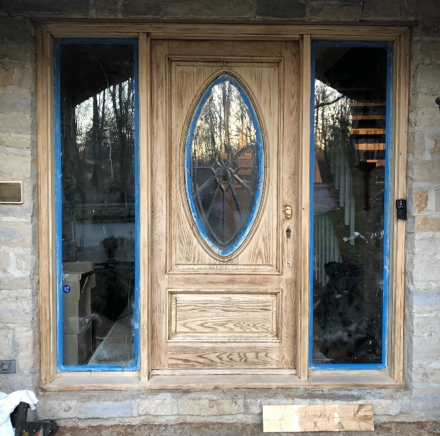 Here is the final front door – Welcome home! 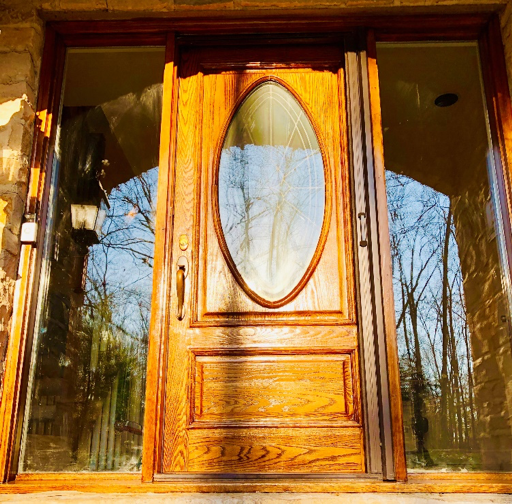 Do you need professional exterior painting or wood repairs in Columbus, Ohio? Our skilled painting team at Sharper Impressions offers interior and exterior residential painting services. Get your free quote today!